Join 8 premier quilt shops for our 14th Annual Charming Spring Shop Hop! Purchase a passport, then travel through the countryside visiting Cabin Arts and The Quilt Box in Kentucky and Margie’s Country Store, L & L Yard Goods, Sharynn’s Quilt Box, Tree City Stitiches, Quilter’s Nook, and Quilters Garden in Indiana. Receive a free enameled charm in each shop, register for the shops’ baskets, purchase special fabric charm packs used to make unique samples shown in each shop, and enjoy seeing all of the latest offerings in the quilting world! You will receive a 20% discount on one pattern, notion, or book of your choice at each shop. 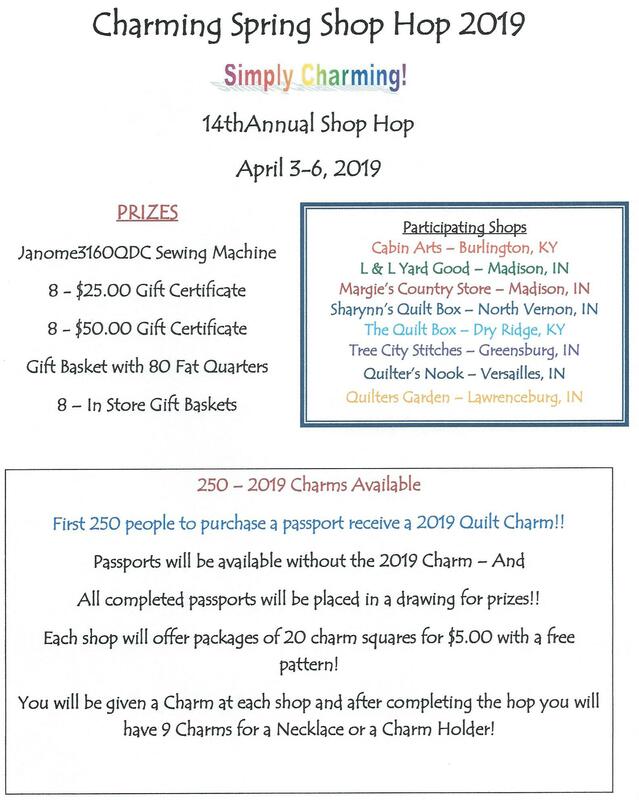 Drop off your completed passport at your last stop and be eligible for the Grand Prizes of a Janome Sewing Machine, a Gift Basket with 80 Fat Quarters, and Gift Certificates at the 8 shops. Grab some friends and start hopping!